We’re all way too familiar with the excesses of the holiday season: spending too much money, eating too much and drinking too much. The only thing we don’t do too much of during the holidays is exercising. So come January, we all start fresh armed with the good intentions of New Year’s resolutions and 10 extra pounds. It might surprise you to learn that 92% of New Year’s resolutions fail. And a whopping 48% of those resolutions have to do with losing weight or staying fit. And for those of us who are frequent travelers, it’s even more difficult to get or stay fit. But, it isn’t impossible. Here are some tips to help even the most indulgent of travelers work toward his or her fitness goals while exploring the world. Dehydration affects the ability of your body to burn fat, encourages excessive calorie consumption and slows down your metabolism. And since travelers spend hours flying in airplanes that are drier than the Sahara, fighting dehydration is key. Before you board the plane, drink a bottle of water. Then drink a glass of water each hour throughout the flight. And as tempting as it is to order alcohol, try to avoid it during the flight. When booking your hotel online, check out the fitness center. My husband is adamant about getting at least one workout on every trip. While I'm looking for the thread count of the hotel’s sheets, he’s examining the photos of the fitness center. Some are as big as our sports club in New York, but even moderate or small fitness centers work. If you only travel once a year, go ahead and indulge in that cruise ship’s midnight buffet AFTER your three full meals and numerous mixed drinks. But if you’re a frequent traveler, that kind of indulgence will lead to trouble on the scales. I’m not suggesting you give up all the fun stuff on your vacation, just don’t indulge around the clock. Also, choose wisely. If you’re having a meal of pasta, skip the bread. Opt for grilled foods over fried and natural over processed whenever possible. As for desserts, share. One dessert and two or three forks works to everyone’s advantage. If you know you’re going to indulge in a heavy meal at some point during the day, make the other meals light and healthy. And if you’re in a situation where meals are being chosen for you, remember, you don’t have to clean your plate…Mom isn’t watching. If your travel includes room service meals, take advantage of the hotel’s "Request Upon Arrival" services to preorder healthy meals. That will prevent you from browsing the menu for comfort food after a long day of travel. And if you’re road tripping, take along fruit and veggies for snacking in the car—it’s much better than a bag of chips. If you’re planning to trek the Andes Mountains or climb Kilimanjaro, you don’t need fitness travel advice—at least not from me. But if you’re a traveler who prefers a more relaxing type of travel that includes sightseeing along with time on the beach or at the spa, these tips will help you incorporate more physical activity into your travels. If you’re setting your sightseeing itinerary, structure it so that walking is the main mode of transportation. You’ll get better acquainted with a destination if you’re walking through neighborhoods, past shops, parks and galleries than you will if you’re speeding by in a taxi. To cover more ground and see more of a city in a shorter time, rent a bike. 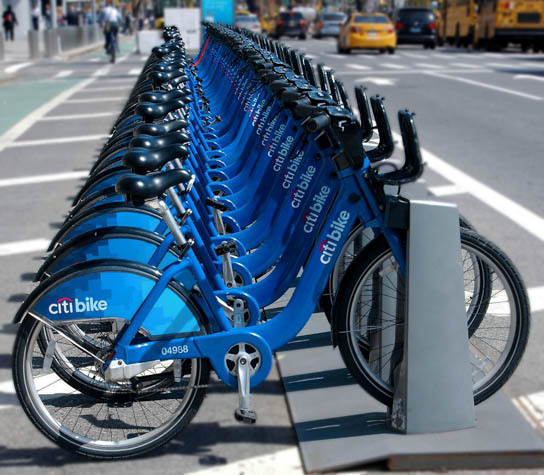 Many cities offer bike rentals by the hour that can be picked up at one location and dropped off at another. If running alone in a new city isn’t comfortable for you, check into local running clubs or running events at your destination and join the group. You’ll meet the locals and get a good workout. Of course hiking is always a great option for an active vacation and with so many incredible National Parks to choose from you’re sure to find one that works for your fitness level. Do you incorporate fitness into your travels?